$1.49 ea. $1.043 ea. $0.894 ea. $0.745 ea. $0.671 ea. $0.633 ea. $0.596 ea. $0.559 ea. DESCRIPTION – This Beauty (pink) Carnation silk flower has an overall length of 16 inches, a 9 inch stem, 3 flowers with a 1 3/4 inch diameter and 6 leaves. DESCRIPTION – This Dark Pink Carnation silk flower has an over length of 16 inches, a 9 inch stem, 3 flowers with a 1 3/4 inch diameter and 6 leaves. DESCRIPTION – This Fuchsia Carnation silk flower has an over length of 16 inches, a 9 inch stem, 3 flowers with a 1 3/4 inch diameter and 6 leaves. DESCRIPTION – This Light Pink Carnation silk flower has an over length of 16 inches, a 9 inch stem, 3 flowers with a 1 3/4 inch diameter and 6 leaves. DESCRIPTION – This Dark Pink Dahlia silk flower has an overall length of 16 inches, a 9 inch stem, 3 flowers with a 3-3.5 inch diameter and 9 leaves. DESCRIPTION – This Fuchsia Dahlia silk flower has an over length of 16 inches, a 9 inch stem, 3 flowers with a 3-3.5 inch diameter and 9 leaves. 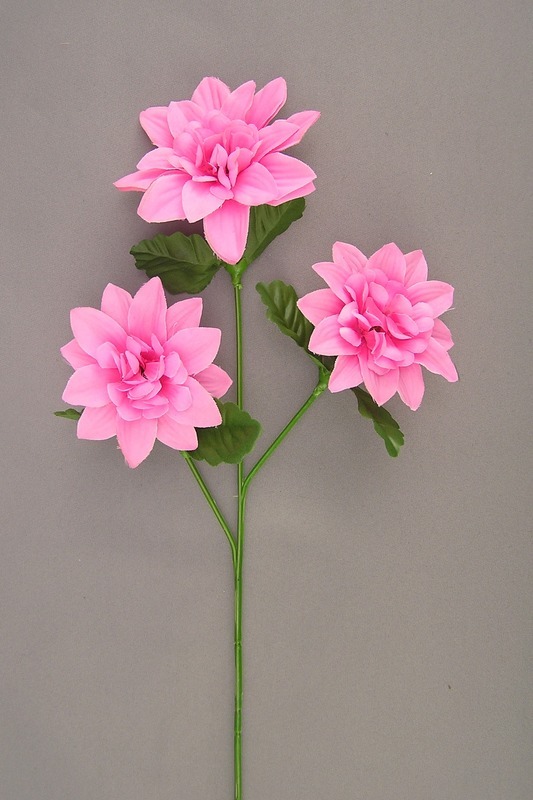 DESCRIPTION – This Pink Dahlia silk flower has an over length of 16 inches, a 9 inch stem, 3 flowers with a 3-3.5 inch diameter and 9 leaves. DESCRIPTION - This Pink Double Gyp silk flower has an overall length of 19 inches, a 8.25 inch stem, 40 flowers with a 1 inch diameter and 20 leaves. DESCRIPTION - This Rose Colored ( Red / Magenta ) Dried Carnation silk flower has an over length of 18 inches, a 10 inch stem, 5 flowers with a 1.5-2 inch diameter, 1 bud and 8 leaves. DESCRIPTION – This Rose Blush (Red/Magenta/Pink) Dried Carnation silk flower has an over length of 18 inches, a 10 inch stem, 5 flowers with a 1.5-2 inch diameter, 1 buds and 8 leaves. $0.79 ea. $0.55 ea. $0.47 ea. $0.40 ea. $0.36 ea. $0.34 ea. $0.32 ea. $0.30 ea. DESCRIPTION – This Fall Dried Pink silk flower Peony spray has an overall length of 23 inches, a 13.5 inch stem, 1 flower with a 2 inch diameter and 3 wired leaves.